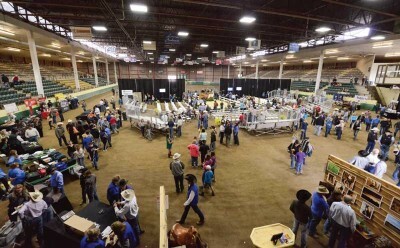 Colorado State University (CSU) held the ninth annual Legends of Ranching Performance Horse Sale on April 26 at the B.W. Pickett Equine Center in Fort Collins, Colo. The sale is a teaching tool for students in the equine science program at CSU. The 2014 CSU Legends of Ranching Sale was held at the B.W. Pickett Equine Center in Fort Collins, Colo. The sale serves as a teaching tool for students in CSU’s equine science program. Wagonhound Land & Livestock Chair in Equine Sciences Jerry Black, DVM.“Our buyers understand this, our consignors support this and our advisory committee takes pride in this. We constantly challenge ourselves to ensure their meaningful participation and they consistently rise to the test. 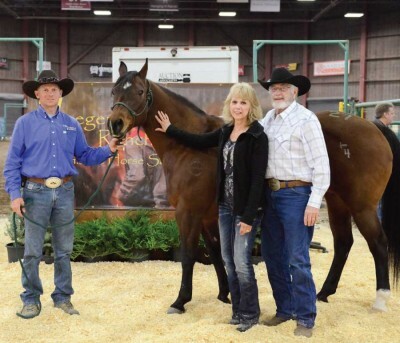 Mike Kelly, representing Wagonhound Land & Livestock, CSU Legends of Ranching Sale highest-seller PC Dustin Della For her new owners, Arden and Jane Morrow, of Gold Bar Ranch, Inc.
teddy bear” who is gentle for anyone. He has miles of experience riding outside, and has been used to rope big bulls and drag calves to the fire. He has also competed in ranch rodeos and is started in the arena as a heading horse. Gallo Jezzy (Gallo Poco Cross x Taris Other Jezzy x Tari Pines For You) was trained by CSU student Bailie Van Leuven. The 2012 bay gelding is described as kind, quiet and easygoing, and was consigned by Robert Norris’ T-Cross Ranches, of Colorado Springs, Colo.